I believe in the grassroots revolution, things like ethical business and social equality are not optional in the longterm. 4) You can send the book via surface mail or airmail - that is completely up to you. 5) If you find you don't have the time to read it when it's your turn please PM and I'll move you to a later slot. Received yesterday from daemonwolf, thank you, will get round to reading it soon. Ok, I am completely useless, this has been on my floor for a while now (except when I packed it to come to uni with me) and I just haven't got round to reading it. My feeble excuses are that I have so many academic texts to read that when I have time for personal reading I just really want a good bit of fiction. So I'm going to pass this on to the next person. Sorry again! Maybe I could be relegated to the end of this ring? You are more than welcome to be added to the end of the running order so you have more time with this one. I'll amend the order now. Posted this morning to nice-cup-of-tea in Switzerland. Hope it arrives safely. "People have to work for their own transformation (...) People often think of this in terms of consuming: There are good things out there and I want them; I have to buy them. Then people just get attached to small things, and forget about the bigger things in life. (...) People have to lose their fear of struggling - not in the sense of fighting or violence, but in the sense of addressing their own problems, and making their own answers." Thanks, I got it the day before yesterday. I'm reading it now. I really like this book. The way it starts with the rural Mexicans becoming Zapatistas and what NAFTA means for them. How it is possible to have a global movement that doesn't have leadership or even a common agenda and in which everybody can participate and still is a recognizable entity with a positive impact on peoples lives. That the so-called anti-globalisation movement is really the globalisation movement whereas the free trade advocates are really licensing monopolies and trying to kill diversity and empowerment of people over their own individual lives. What the slogan 'think globally, act locally' looks like in practice in very diverse settings. I have been anarchistic and passed this book on to my sister kaychrysalis and asked her to send it to akg. Arrived in the post today. I have to admit I don't really remember signing up for this ring, but reading the back of the book I understand why I wanted to read it. I've got another couple of books to read first, but I'm looking forward to starting this one. I just wanted to provide an update. I've started this book and I've got about 80 pages in, but I have to admit I'm finding it slow going. I'm really interested in the topic though so I'm going to keep going with it. I am posting this on to MrsDanvers this evening. I've got two thirds of the way through and just stalled. I don't know why this happened because I was finidng it very interesting. I've carried it to Dorset, Kent and Surrey but it didn't seem like I was going to pick it up. Sorry for the delay in getting this moving and thanks for the opportunity to read it. It has certainly got me thinking about things, particularly the media. Just when I thought I had space to read it I get a PM to say two more rings are about to arrive. Sorry about this but I'm over-running - too many rings arriving at once. I'm about a quarter of the way through and if you can be patient with me I'm now able to get cracking on it. I really enjoyed this book, as a summary of global anti-capitalist activity. As an old lefty it is interesting to see the way in which "single issue politics" have taken over from the multi-issue party politics, at a ground level. The big parties are SO out of touch. The reality is that what I knew as single-issue politics now has a global impact, because the issues are all linked. I particularly enjoyed "the Church of stop shopping" chapter with its focus on local versus multi-national, and was also greatly amused at the commenst on the Socialist Workers Party, as I came across them so often in my "political" days. Sorry this is late I posted the book off and forgot to do the journal. Drusillamac has asked to be skipped as she's up to her eyes in rings and rays ,so the book is on its way to catsalive Down Under. I was posted around about the 25th July, by surface mail. I have received this book, thankyou MrsDanvers. Fascinating reading that provides me with a spark of hope for the future. I love that this is a PRO-democracy, PRO-many-things, movement, rather than an ANTI-globalisation one. That is my great fear here in Australia, that the people who are supposed to look after our interests and well-being have left democracy behind for corporate power. I hate that so-called FREE-trade agreement & the damage that NAFTA has done to so many. Power back to the people. I was amazed at the corporate-person-ness of companies in USA, no wonder it's so difficult to make them accountable. Thankyou, daemonwolf. Many things have become a little clearer to me on reading this interesting book. I'll send this off to lmn60 in 2007. Posted to lmn60 this morning. Yikes! Bookrings are like buses... nothing for ages.... then they all arrive at once! Three in as many days!!! I'm looking forward to this one, though it may take me a week or so to get to it. What an important book - thank you for sharing it daemonwolf. 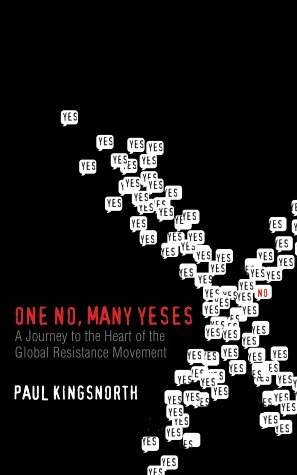 I have been interested in the anti-globalisation movement for some time, and this book helped clarify some information and some views for me. I was particularly interested in the two chapters on Mexico and West Papua - though I also loved the information on Reverend Billy and the 'Stop Shopping Day'. I was in Chiapas only a couple of years after the Zapatista 'revolution' and was fascinated by the legendary status that had grown up around Marcos and the guerillas. Kingsnorth's chapter helped put some of the political ramifications in more context for me. The West Papuan situation has been a simmering sore in the Pacific for a long time, and it looks possible that things could erupt sooner rather than later. This week there has been an advertising campaign to increase 'ordinary' Australians awareness of the situation in West Papua - and laying responsibility firmly at the feet of the Indonesian military. I watch this for further developments with interest - especially as I feel my own government has been complicit in the repression of the West Papuan people - both economically via Rio Tinto etc., and by their silence on abuse of human rights. I have a couple of minor criticism of the book (I'm well known in my circle as a nit-picker! ): Kingsnorth's tone seemed to me to be reserved and objective throughout much of the book - so I was a little surprised by the strength of the statements and convictions he espouses in the last chapter - there'd been to clue to his passion earlier. Also, some of the information is dated - I know that that can't be helped, but it did at times frustrate me. I wonder what, for instance, the effect of the current 'action' in Iraq is having on the neo-liberal movement. Anyway... enough of my banging on. Thanks again for sharing this one with me - I have PMed janey-canuck for her address and will send it on ASAP. received in the mail... thanks! I just couldn't get into this. Maybe it was because I'm swamped at work and need mindless reading when I get home but I've tried a couple of times and couldn't get much past page 25. Luintaurien has asked to be skipped but I have Buffra's address and will be mailing out tonight or tomorrow. Sorry for holding onto this for so long, but thanks for sharing! I really have nothing to say -- I've had the book far too long for an apology to even come close. I am very sorry, though. Chryso asked to be skipped, as did sunflowergirl and spacecadet. So, the book is winging its way to Fluffy-Owl as we speak. I hope it arrives safely! Received in the post today, I do like hearing a book land on the mat through the letter box! I will actually start reading this soon, and hopefully will be more successful than last time I had it! I learned a lot from this book. Particular chapters engaged my interest more than others, mainly the ones about countries to which I have been. Has made me think. Will be posted off when I have stubee's address. First of all thanks to Fluffy-Owl for sending this my way it's arrived safe and sound. Secondly thanks to daemonwolf for starting this ring, back in 2005 - wow, it's been on an incredible journey so far! It's arrived at just the right time, I've got Mark Z. Danielewski's "House Of Leaves" as a bookring to read but my girlfriend KT-J is in the middle of that at the moment so I was reading Samuel Beckett's "Worstward Ho" just to fill the gap while I waited and low and behold I'd just finished it the night I picked this out of my mailbox. This is an interesting read. I hadn’t really taken much notice of the Anti-Globalisation movement before but this is a great insight and I really enjoyed Paul Kingsnorth’s account of his time exploring the rise of the ‘anti-globalisation’ movement around the world. My knowledge of activism is built on pure fantasy, Tyler Durden being the ultimate activist [see: Chuck Palahniuk “Fight Club”] so this was a real eye opener for me. There so much information in this book and therefore I’m not going dwell on this in this Journal Entry, I just feel it’s an important book and should be read by a bigger audience. It’s got me scowling the internet for more information and I’ve even become a fan of Subcomandante Marcos on facebook! Thanks again daemonwolf for bringing this book to my attention and for starting this ring, fio-dagua and Charlenemartel both asked to be skipped so this will be off to Joanthro in Denver (USA) very soon. The book arrived safely today and I am looking forward to reading it. Thanks for the postcard Stubee! I wish I had had more time to really read this! As it was, I dipped in and out to try to get a feel for Kingsnorth's thesis. The main thing I came away with was that I need to get a copy of my own so that I can really tear into it. Thanks so much daemonwolf for making this available! This one has safely made it home! Off to find a new reader. This is being released as part of my own challenge to release another 500 books by 31MAR2011 - see http://101ofawolf.blogspot.com/ for details.